It is hard to believe, but the last time I finished a tatting project of any sort was over a year ago. Around the time I was working on designs from Tina Frauberger’s Schiffchenspitze and the TAT certification I had an allergic reaction to a medication that due to swelling caused all my tendons to become inflamed. I had to quit tatting. I have continued to think about tatting and have started a few things only to be very disappointed in my lack of control over the thread. Last August a friend asked me to join her in a class for the older crowd on bobbin lace. Her daughter even offered to watch my youngest while I went. I have indeed fallen in love with bobbin lace and will have to extend this blog to include that aspect of my life. 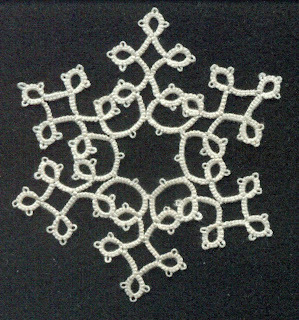 All this hand weaving has made me want to again return to tatting and today I actually finished a small project. In Tina Frauberger’s Schiffchenspitze, band 2, this is figure 51, Sechsteilige Grundform (Six-part basic form). It is the basis of three other figures; though one of those is actually several repetitions of one of the other two. Since this is such and easy pattern to memorize I do plan on working with the other figures. Hopefully my tension and my technique will come back. Well hopefully not all of my tension. It is late tonight so sometime soon I will relate a story that shows just how tight my tatting is. Sometimes I think my early success was not due to my control but to the resilience of the thread. You can only squeeze it so far. Though it is not very symmetrical and I see all sorts of issues in my work this is the first tatting I have finished in a long time. Figuring out the German did take some effort but that was almost a year ago. This book is much abbreviated and what the pattern amounts to is a statement saying something like all rings are 4 – 4 – 4 – 4 and the chains in the middle are 6 – 6 – 6 – 6. I used a magnifying glass to determine that all chain segments are 6 ds and all ring segments are 4 ds. This should actually be enough information for you to copy this. Thank you. Fig. 53 Handbuch Der Schiffchenspitze, band 2. Fig. 52 Handbuch Der Schiffchenspitze, band 2.